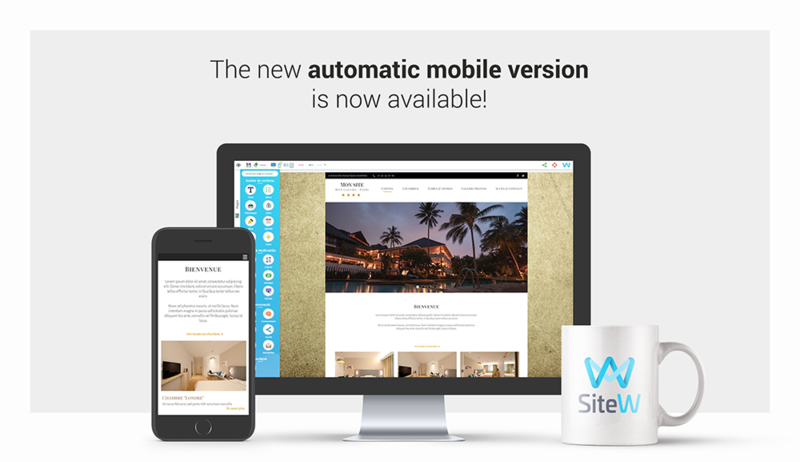 SiteW has improved the automatic mobile version of your website. In a nutshell, it means that you can now, in only one click, generate a version of your website, that is optimized for smartphones. This version is automatically optimal, and you don’t need to adjust it, element by element. This tool allows you to create, very quickly and easily, a mobile version of your website, that improves the SEO and the user-experience of your site. The automatic mobile mode: what is it? This mode allows you to generate the mobile version of your website, in an automated and synchronized way. So your website will adapt to all kinds of mobile devices, in one single step, and it will also be mobile-friendly for search engines. How to enable the automatic mobile website? This new mode cannot be easier to use: the only operation required is to enable the mode, in just one click. Click on the phone icon, located on the top toolbar, on the website creation page, then, in the drop-down menu, select “Automatic mobile website” (see footnote). What will my mobile website look like, with the automatic mode? The automatic mobile mode makes your website responsive: the latter will be able to display on mobile devices (on both vertical and horizontal mobile screens), in an optimal way. It can organize the blocks in order to make your mobile website as similar as possible to your Computer version. For example, the blocks set out in columns or the blocks with an Image or a Box block as a background, will be maintained and made smaller to fit mobile screens. It disables the blocks unsuitable for mobile devices: for instance, the empty Text blocks or the unwanted spaces in text. The mobile toolbar remains configurable, just like in the custom mobile mode. The changes made on the Computer view are automatically copied. If you add or delete blocks, the mobile mode will be automatically updated, and you don’t need to adjust the visibility of the blocks on the Mobile view, as with the custom mobile mode. The content of the mobile version cannot be modified on this view (it is not possible to add, delete or modify blocks on this view, nor is it possible to change their size or location). If you want more customization, you can use the custom mobile website mode. It will soon be possible to modify some elements of the automatic mobile website: you will have the possibility to hide blocks, or even to change the order of the blocks. Nevertheless, the custom mobile mode will remain the most flexible mode, if you want to optimize your mobile website. To conclude, the automatic mobile version will make your life much easier: it adapts to any mobile device and it is also search engine optimized, without any intervention required by you. *Footnote: the automatic mobile mode is not available for websites that contain more than 50 pages (it would take too long to publish the website).